Where to start… its been busy at Chez Clarkson. Despite my determined efforts to unglue myself from twitter and spend more time on my blog I managed to get side tracked again. In fairness we are putting our house on the market so the last few weeks have been given over to last minute decorating and spring cleaning and any spare time I’ve had I have chosen to do food related things rather than write about them! So this post is a random scattering of all the things that have been pinging around in my head lately but havent managed to make it to page because I was too busy holding a paintbrush and a pot of paint. As a result of all my twittering, I discovered Total Food Geeks and last week I put down the vacuum cleaner and dragged Dawn to their open night for a couple of hours. TFG is an Edinburgh foodie community and a blog that shares all kinds of food related news and information (they word that a lot better if you want to have a look for yourself). The evening started with a rather traumatising/hysterical parking episode because parking in Edinburgh centre is hard enough at the best of times and the council happened to have decided to close George street on the same night but after much driving in circles and getting flashed at by other drivers (including a bus) we eventually found a space and arrived at Underdogs a little late. Because we were late and driving (i.e. only one glass of wine for Dawn and for me in sympathy), we didn’t really get into the full swing of things as planned but we did meet Georgia and Emily who started the group and were lovely and told us a bit more about what goes on. Just taking the first step towards meeting other foodies was a great event in itself and as soon as I assuage my guilt by drafting this post I will be writing up my details to join in the activities over on the TFG website (very excited and somewhat nervous about this but trying to limit the number of exclamation marks so you dont feel like I’m shouting at you). Next time though I am definitely taking the bus and hitting the vino! Photo courtesy of the ladies from Total Food Geeks as I was too awe struck to snap my own. One of the reasons I’m a little nervous about signing myself up for things like TFG is because I’m not a professional writer and the complete lack of enthusiasm for my last jar swap idea didnt exactly prove me otherwise. 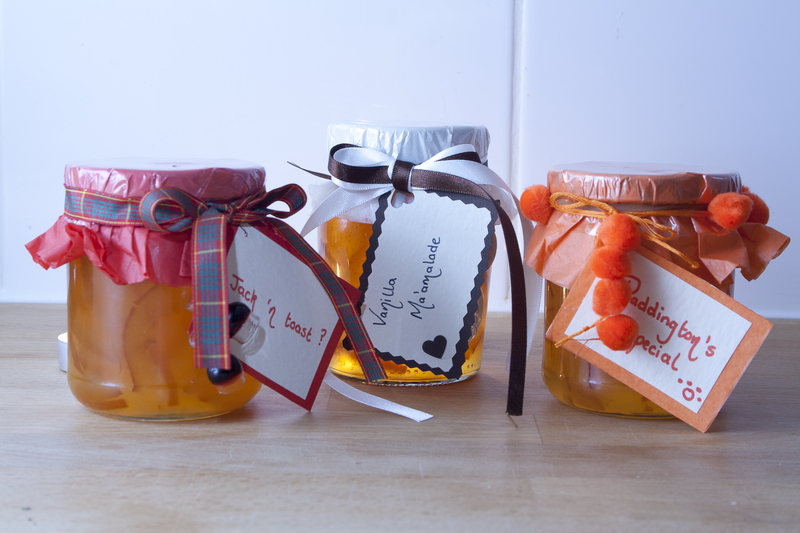 So I’m trying not to draw attention to it really, but I promised to share the marmalade recipe and we did actually learn a lot about what worked/didnt so here it is, accompanied by a picture of our dressed jars that we entered into the marmalade awards. Update! I’ve just had to edit this paragraph before publishing it as although I thought we had won absolutely nothing, an envelope arrived in the post today announcing that we had in fact been given a silver for our novice entry and two merits for our other two! So we didnt actually win but I’m pretty proud nonetheless. And I will draw your attention to our choice of names… we thought we were extremely witty! We made two batches from different recipes and found that parts of each were the most successful so this recipe is a combination of the British Larder and River Cottage versions. Scrub the oranges, remove the buttons at the top of the fruit, then cut in half. Squeeze out the juice and keep to one side. Slice the peel, pith and all, into shreds (we removed a little of the pith to get prettier slices). Put the sliced peel into a bowl with the orange juice and cover with the water. Leave to soak overnight or for up to 24 hours (we found the soaking made the marmalade taste much better and less bitter). Transfer the mixture to a preserving pan (we put the pulp and seeds in a muslin bag and added them as well), add the vanilla bean and vanilla seeds, and the lemon juice. Bring to the boil, stirring until the sugar has dissolved. Boil rapidly until setting point is reached, about 20-25 minutes. Remove from the heat. Leave to cool for 8-10 minutes then stir gently to disperse any scum. 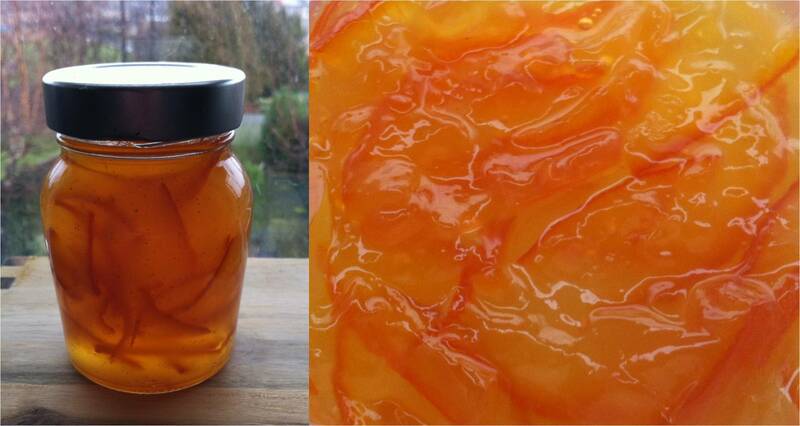 Pour into warm, sterilised jars and seal immediately. Now back to my commitment to writing. Ive been thinking about this blog, what I enjoying writing about and what is most useful to others who read it, and in addition to (hopefully) posting on TFG now and then I think I’m going to write more short posts in future as soon as I find things that I think are noteworthy, rather than waiting until I have a successful recipe to share. Somewhere between a twitter update and a full blown story. 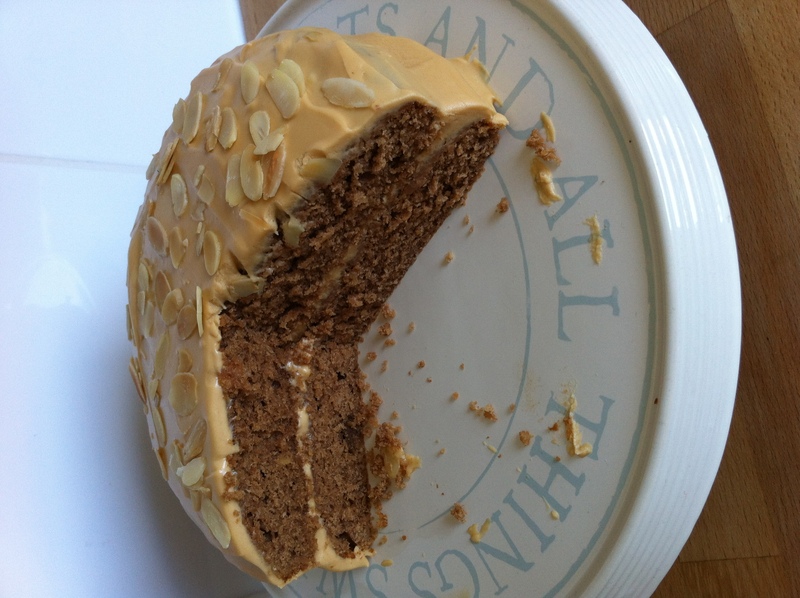 I made this caramel cake yesterday from Dan Lepard’s cookbook Short and Sweet, but substitued almonds for hazelnuts and although I didn’t manage to entice the surveyor into having a slice while he was doing our home report (blatant attempt to boost property prices with baked goods I’m afraid), I’m quite glad because I have it all to myself now. The dulche de leche icing is the best part. You can get the recipe here and I recommend you do. And last but not least, I have also booked tickets for Aoife Behan’s supper club in April. Its my first supper club. I have been quiet… quiet but not idle. After the glut of Christmas, I couldnt face another mouthful of pastry, sugar or butter loaded baking so like many others I decided to take a week or two off from my self inflicted cooking challenges and writing and come back to it all after a detoxifying break. Then Somewhere over the cold evenings of January I discovered twitter. Well I say discovered, I joined twitter a while ago but I didn’t really get it at first. I couldn’t get past the weird short hand and disjointed conversations. And then I must have just found the right sort of people to follow because suddenly I could spend hours reading messages from other bloggers and bakers and twittering away in response. And that’s how I missed January. The whole month gone and not a single post. And I barely noticed because I was so busy overloading on other blogs and food chat. In the process, I made some new connections with other bloggers (I say connections because I feel one can’t call someone a friend until you have bonded over a glass of wine or at the very least seen each other in the flesh but I am excited to have found them nonetheless) and discovered some really cool things happening in Edinburgh centred around food. Farm shops and markets, supper clubs, guerilla burgher munching, food geek get togethers (connections plus wine equals new friends!) and I’m following some other clever people/ projects if you are looking for twitter inspiration. So before I get so comfortable over on twitter that I stop writing altogether I thought I better put my focus back to my own blog and what I’m going to do with February. It’s supposed to be retox month, end of the diet, hello junk. I’m trying to stay on the wagon a little longer than that this year so I’ve decided to learn a new skill that means I can store up the calories and ration them somewhat. And hopefully I’ll win a prize at the same time. Thanks to family, I got all the jam making goodies I put on my Christmas wish list and February happens to be marmalade month. 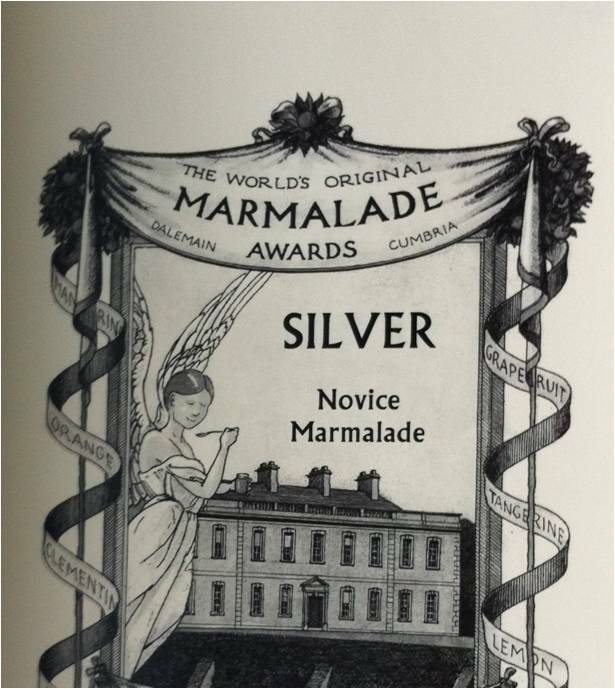 Seville oranges are in season and the Marmalade Awards are taking place in Dalemain at the end of the month. 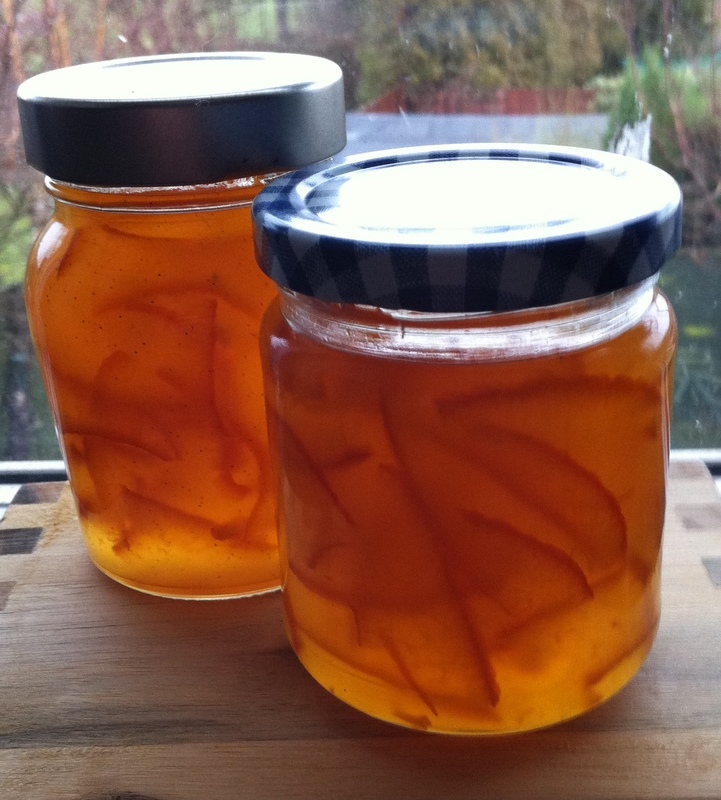 So this month’s project is preserves and first, marmalade. My marmalade partner in crime is my friend Dawn who is also a marmalade novice so we are entering the competition together. Recipe and results of our novice jamming to follow soon but first a challenge. Having a kitchen cupboard full of marmalade got me thinking and I’ve decided to try a project of my own. I’m calling on everyone to make their own batch of preserves and enter them into a “jar swap”. You can make any kind of preserve and enter it. Jam, vinegars, pickles…sweet, savoury… anything you want. At the end of the month I’ll put all the entries in a hat and give everyone another person to send a jar of their preserve to. So you give a jar and you receive one in return. Its a bit of fun and a chance to share with other bloggers across the country. I also happen to have a spare copy of River Cottage Preserves, thanks to an over zealous christmas fairy, so I’m going to give that away as a treat for the best preserve. Just post a comment on my blog by the 4th of March with a link to your entry, keep a jar in the cupboard, and I’ll send you the name of the person to send it to at the end of the competition and choose the winning recipe.